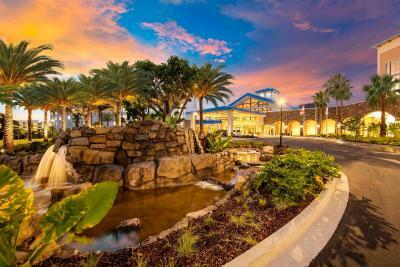 Lock in a great price for Universal's Loews Sapphire Falls Resort – rated 9.1 by recent guests! The aminities, the proximity to the parks and the early access to the parks. Lovely place. Not a fan of amusement parks etc did it for my daughter. Everything was nice....fake....but nice. Think I’ve seen enough faux stone walls and man made lakes and waterfalls to last a lifetime. The workers were above and beyond helpful and friendly....sincere I think. The little food shop was wonderful for coffee and snacks. Loved the hotel and resort.....just had my fill of Universal after the second day. Modern, clean hotel with decent amenities at an affordable price point. Super easy access to Universal by boat or walking. restaurant downstairs was exceptional. we didn't visit the bar/lounge on the lobby level. The little a la carte restaurant was great and convenient. Pool area was awesome....offered so much and atmosphere made us feel like we were really on vacation (except for loud & ongoing DJ). So beautiful, clean, great location and lovely staff. Our second visit from Australia within 6 months. We enjoy it so much the first time we made sure we stayed longer this time. 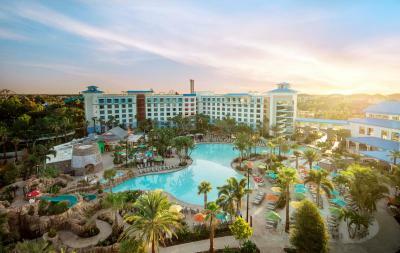 The location is great for going to the Universal theme parks, walking distance or a short boat ride. Location was great. Water taxi to the park was awesome. This hotel was awesome. We loved the fresh, bright and modern decor. It is so family friendly with a ton of activities by the pool for children. My kids particularly enjoyed the "dive-in" movies at night. The hotel is very close to the Universal theme parks. It was easy for us to take a break from the theme parks in the afternoon and return in the evening. 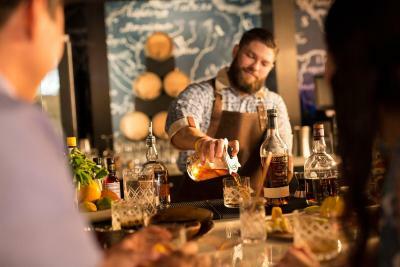 The staff was very friendly and extremely helpful. 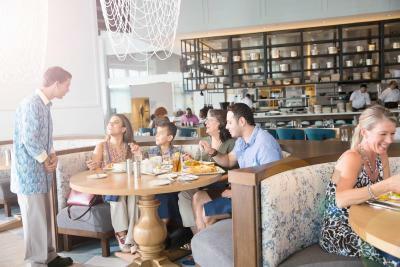 Universal's Loews Sapphire Falls Resort This rating is a reflection of how the property compares to the industry standard when it comes to price, facilities and services available. It's based on a self-evaluation by the property. Use this rating to help choose your stay! 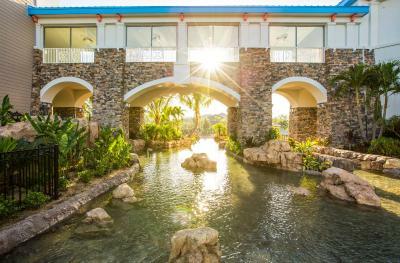 A 49-inch flat-screen TV, free WiFi, and an iPod docking station are included in every room of this Caribbean-inspired resort. 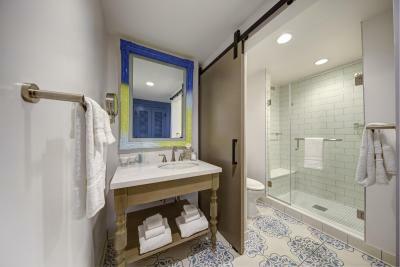 Additional amenities include a small refrigerator and private bathroom. 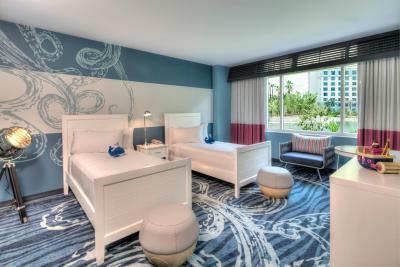 Select rooms offer views of the lagoon or pool. 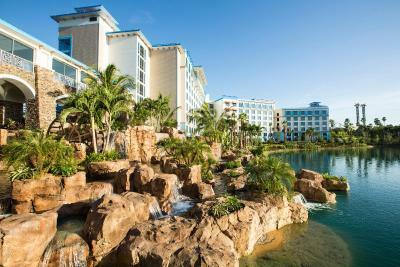 The resort features free transfer service between Universal Studios™ and Universal's Islands of Adventure™. Other on-site facilities include a fire pit, games room, and fitness center. 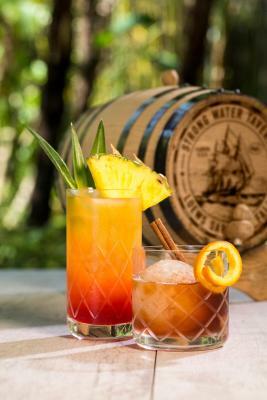 Universal’s Loews Sapphire Falls Resort offers 4 on-site restaurants, including Drhum Club Katine, which features Tapas-style offerings, and Amatista Cookhouse, which serves Caribbean cuisine for breakfast, lunch, and dinner. 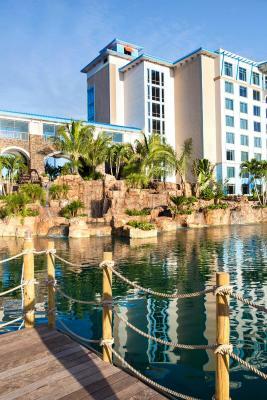 The resort is located 10 minutes’ drive from SeaWorld Orlando and 8 minutes’ drive from Orlando Premium Outlets – International Drive. 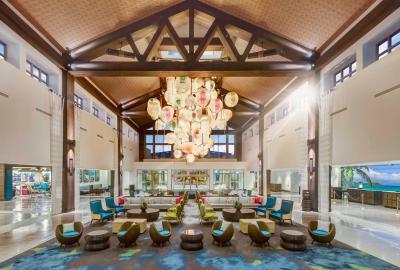 Orlando International Airport is 17 minutes’ drive from the property. 뀐 Located in the top-rated area in Orlando, this property has an excellent location score of 9.5! 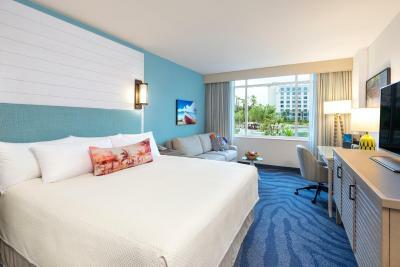 When would you like to stay at Universal's Loews Sapphire Falls Resort? This room features a 49-inch flat-screen TV, small refrigerator, and single cup coffee making facilities. A lighted cosmetics mirror and iPod docking station are provided. Offering a view of the lagoon, this queen room features a 49-inch flat-screen TV, small refrigerator, and single cup coffee-making facilities. Offering a view of the lagoon, this king room features a 49-inch flat-screen TV, small refrigerator, and lighted cosmetics mirror. This queen room offers a view of the pool and features a 49-inch flat-screen TV, small refrigerator, and single cup coffee-making facilities. The room offers a pool view and 2-person sofa bed. It features a 49-inch flat-screen TV, small refrigerator, and single-cup coffee-making facilities. This king suite features a 49-inch flat-screen TV, small refrigerator, and single cup coffee-making facilities. Ironing facilities and an private bathroom are provided. 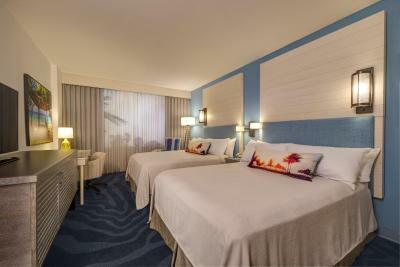 This suite features themed décor and interlocks to the adult bedroom. An iPod docking station, 49-inch flat-screen TV, and private bathroom are provided. This spacious suite features a separate seating area and dining area as well as a 49-inch flat-screen TV and iPod docking station. A wetbar and a small refrigerator are provided. This spacious suite features a separate seating area and dining area as well as a kitchenette and a 49-inch flat-screen TV. A full, private bathroom is provided. 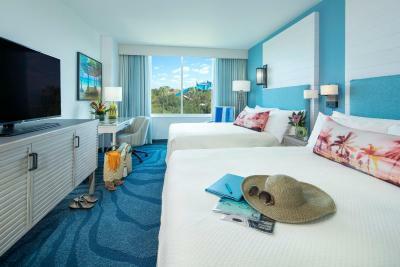 House Rules Universal's Loews Sapphire Falls Resort takes special requests – add in the next step! Universal&#39;s Loews Sapphire Falls Resort accepts these cards and reserves the right to temporarily hold an amount prior to arrival. Universal's Loews Sapphire Falls Resort accepts these cards and reserves the right to temporarily hold an amount prior to arrival. Please note guests must be at least 21 years of age to check in, and photo identification must match the name on reservation. Please note if the booking is canceled, the guest will also be charged applicable taxes. Early Park Admission begins one (1) hour prior to regular scheduled park opening to either Universal Studios Florida™ or Universal’s Islands of Adventure™ as determined by Universal Orlando. Valid at select attractions at each park. Attractions are subject to substitutions without notice. Additional restrictions may apply. Only one place to get coffee in the morning and the lines were excessively slow. Rooms were small and difficult to get around. The hotel is wonderful. Great location with easy access to the parks. The Walmart grade paper toilet (too thin), the dirty machines to work out and the inability to clean them. Regarding room service, I experienced the same problem that I did the last time I stayed at the hotel. This involved ordering steak and this time around a burger as Medium cooked. Both times I received a charred and burnt meal. The first time my meal was replaced with a better cut of meat cooked correctly. This time around I didn't call up room service again because I was just exhausted from enjoying the parks all day. I would just recommend to honor requests when it comes to room service orders. Charged $ 20 for bottled water in the room at check out! Should be complimentary! Especially since the price of food in the hotel was so expensive! The on-site universal employee was not helpful and rude. Cleaning staff didn’t come to our room until the evening and didn’t change our sheets! Hotel is beautiful and front desk staff were friendly and helpful. No tub in room which I found odd since the resort is built around a theme park. Makes bath time with little ones more challenging then it needed to be. Some of the staff were great - helpful and chirpy. Some (mostly in catering) were clearly not that happy to be there, so some work on staff morale/conditions needed. Food like most places in or near parks is not good and pricey. DJ at the pool most of the day was too much. It was too loud. I was there vacationing with my adult children. And the food and the service at the pool was not very good. 90 degrees and we waited an hour for 2 glasses of water!